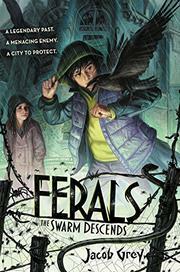 Caw and his friends return in this sequel to Ferals (2015). Exploring his parents’ old house, Caw, a white boy and crow feral (a person who can communicate with and control a certain kind of animal), finds a pale-skinned squatter named Selina. Though he wants to welcome her, Caw hesitates, a decision that turns out to be fortuitous. Outside the house, Caw’s accosted by an old man who gives him a mysterious stone that belonged to Caw’s mother. Caw eventually notices that touching the stone makes him feel bad, but it isn’t until near the end of the book that he fully comprehends its abilities. Third-person narration unveils a plot similar in its predictability to the first book, within which good characters are good and evil characters are evil. The book’s villain, the Mother of Flies, is forever ranting about the other ferals not respecting fly ferals, which does give her a glimmer of dimensionality, but it’s not enough to paint her as anything more than heartless. And though characters vacillate about whether Selina—who turns out to be connected to the Mother of Flies—is evil, she’s always merely a pawn with a good heart. The end finds Caw triumphant, at least temporarily—a tidy setup for a third installment.